Clothes with printings that presents famous artists' paintings are curently very popular. Personally, I liked that trend, so in my wardrobe there are also few items in that style. 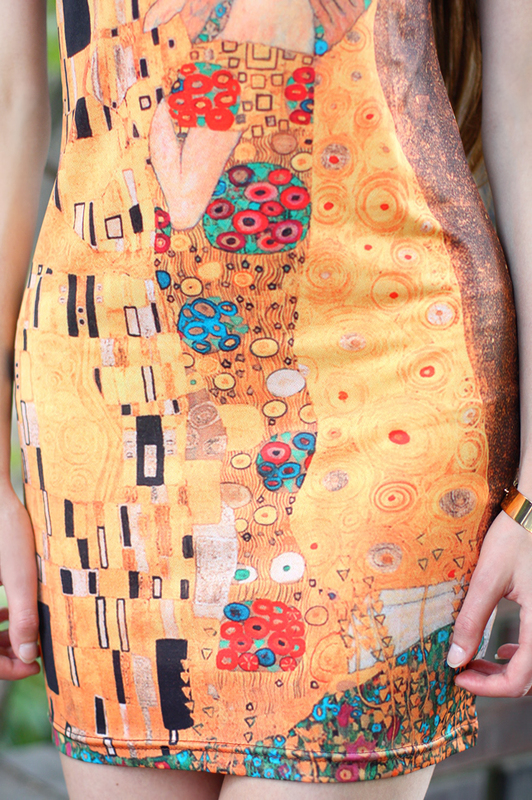 One of them is a short dress with printing that shows one of the most famous works of Gustav Klimt entitled "The Kiss". Identical you can find <here>. Beyond all doubt, the dress looks absolutely original! Does anyone know that Gustav Klimt in his genuine painting has used goldflakes? I refered to that idea by adding gold accesories. No i Twoja figura. Jak ty to robisz?? Świetne ostatnio poczyniłaś zakupy, różne stylistycznie, ale przyciągające wzrok. bardzo ciekawa ta sukienka + masz świetną figurę! your outfit looks amazing *_* your blog is very good and interesting. maybe we can follow each other if you like :)) im glad if you visit myb blog, too. keep in touch! Gorgeous dress and style !!! Love your blog, you're so cute !